This 36-page book gives you the patterns and know-how to create 14 dazzling mosaic projects, along with ideas for adapting the designs to different uses. Includes special instructions for each project. Most of the projects are pictured in full color. 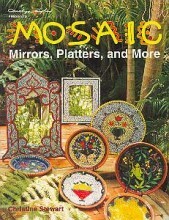 Click the button below to add the MOSAIC MIRRORS, PLATTERS & MORE to your wish list.